University of Illinois entomology professor and department head May Berenbaum and entomology and neuroscience professor Gene Robinson and their colleagues identified a mechanism that could explain the variety of ill effects seen in Colony Collapse Disorder. CHAMPAIGN, lll. - Researchers report this week that they have found a surprising but reliable marker of colony collapse disorder, a baffling malady that in 2007-2008 killed off more than a third of commercial honey bees in the U.S. Bees in CCD hives have unusually high levels of ribosomal fragments, a symptom of infection with multiple picorna-like viruses, the researchers found. Their study, in the Proceedings of the National Academy of Sciences, is the first to identify a single, objective molecular marker of the disorder, and to propose a data-driven hypothesis to explain the mysterious disappearance of American honey bees. The team included researchers from the University of Illinois and the U.S. Department of Agriculture. U. of I. researchers spearheaded the honey bee genome project, which was completed in October 2006, less than a month before the first reports of colony collapse disorder (CCD) began to circulate. The new study made use of the genome and a genome-based tool, the microarray, to look for differences in gene expression in the guts of healthy honey bees and in those from hives afflicted by CCD. Such microarray analyses normally identify only active genes - those that have been transcribed into messenger RNA in the first stage of building proteins. But Reed Johnson, a University of Illinois doctoral student in entomology and first author on the study, noticed that the microarrays were turning up large quantities of fragmented ribosomal RNA (rRNA) in the bees affected by CCD. Ribosomes are the factories in which proteins are made, but Johnson observed that this rRNA contained adenosine-rich sequences not seen in normal ribosomes. Such "polyadenylation" is believed to be a sign of ribosome degradation. "Microarrays for other organisms also contain these mysterious pieces of ribosomal RNA, for reasons that are not yet altogether clear," said entomology and neuroscience professor Gene Robinson, a co-principal investigator on the study with entomology professor and department head May Berenbaum. But comparisons of healthy bees and bees from hives afflicted with CCD showed that the fragments were present at a much higher frequency in the CCD bees, he said. 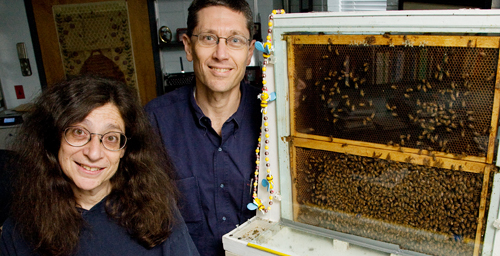 "They are overrepresented in the CCD bees, significantly overrepresented," Berenbaum said. "The one consistent indicator of CCD across samples collected at multiple times and in multiple places was the overabundance of ribosomal fragments." 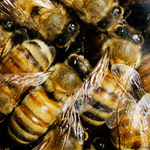 When the team looked at the pathogens of healthy bees and bees from hives affected by CCD, they saw that the CCD bees suffered "more than their share" of infections with viruses that attack the ribosome, Berenbaum said. These so-called picorna-like viruses "hijack the ribosome," she said, taking over the cellular machinery to manufacture only viral proteins. The list of picorna-like viruses that afflict honey bees is long and includes Israeli acute paralysis virus, which was once suspected of being the primary cause of CCD. Numerous suspects have been identified in the hunt for a cause of CCD, from nutritional deficiencies to exposure to genetically modified plants or pesticides. Researchers in Spain recently pointed to a parasitic fungus, Nosema ceranae, which afflicts many CCD bees in Spain. The loss of ribosomal function would explain many of the phenomena associated with CCD, Berenbaum said. "If your ribosome is compromised, then you can't respond to pesticides, you can't respond to fungal infections or bacteria or inadequate nutrition because the ribosome is central to the survival of any organism. You need proteins to survive," she said. The varroa mite, which is believed to have killed off a significant number of honey bees after it was accidentally introduced to the U.S. in 1986, is a carrier of picorna-like viruses, and is likely a significant contributor to the high viral pathogen load that afflicts U.S. bees. The mite may act as a tipping factor leading to ribosome breakdown, the researchers said. All of these influences, along with the practice of carting bees around the country for pollination services, are significant stressors on the bees, a heavy burden that would be amplified by a loss of ribosomal function, Robinson said. This study was supported by the USDA. Berenbaum is also an affiliate of the Institute for Genomic Biology at Illinois. Robinson directs the Neuroscience Program at Illinois and is a faculty member of IGB. Editor's note: To contact May Berenbaum, call 217-333-7784 ; e-mail: maybe@illinois.edu. To reach Gene Robinson, call: 217-265-0309; e-mail: generobi@illinois.edu. The full text of the paper, “Changes in Transcript Abundance Relating to Colony Collapse Disorder in Honey Bees (Apis mellifera),” is available.